My husband and I will travel to Germany with our two college aged daughters March 15-23 (one daughter and I will stay another week). The focus of our trip will be Berlin, which 3 of us love and the other 1 hasn't yet seen. I purchased the tickets today, and got great fares flying into Frankfurt (from 3 different cities in the US, all meeting up at JFK). We land on Saturday morning, March 15, and wish to head immediately out. We will likely take the train, as we all love train travel and it will allow us to sleep/doze in our jet lagged state. I'm interested in finding a city or town to stay Saturday night. We'd arrive during the afternoon Saturday, and ideally would walk around the city center, eat a nice meal and crash. The next morning after attending (Catholic) church, we'd continue our journey to Berlin where we will stay for 7 nights. I'm wondering about Leipzig or Hannover, or is there somewhere else that fits the bill? Two of us have already visited Dresden and really had a great time. Two of us have visited Cologne and loved it (but it's not on the way) although the service in the Dom was fabulous. This will be Palm Sunday, if that makes any difference. Now that I have the plane tickets, I'm getting so excited for this trip! My husband and I recently drove to Berlin from Frankfurt, stopping in Eisenach. But there is a train that leaves directly from the airport and gets to Eisenach in 2 hrs. You don't say what your interests are . . . or your budget. But we are interested in classical music and history, and that is why we chose to stop in Eisenach, the birthplace of J.S. Bach and also Martin Luther. There is also a fabulous castle there, Wartburg Castle, a World Heritage Site. Best of all, there is a hotel adjoining the castle grounds, Hotel Auf der Wartburg. 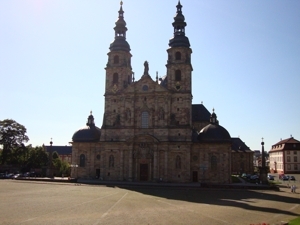 Fulda is only a short train ride from Frankfurt, and has an impressive cathedral. Not a big city, but maybe just what you want after a long flight. The trains from Frankfurt to Berlin all stop in Fulda, so you won't have to connect or backtrack to get on your way to Berlin next day. Fulda definitely has the most impressive cathedral for a Sunday morning mass of those mentioned. Thanks! This is great information and will give us some options. While a 4 hour train ride isn't that bad the first day, if we stop we can sneak in a little look at another German city before spending a week in Berlin. From that point of view, I'd choose Erfurt. Weimar and Eisenach are also great options-but clearly not catholic.